Too late to be a June Bride? There’s always July, August and September! Teplis can help you plan a once in a lifetime wedding (They should all be that way!) on a beautiful, tropical beach in a setting where every guest will be making memories to cherish forever. 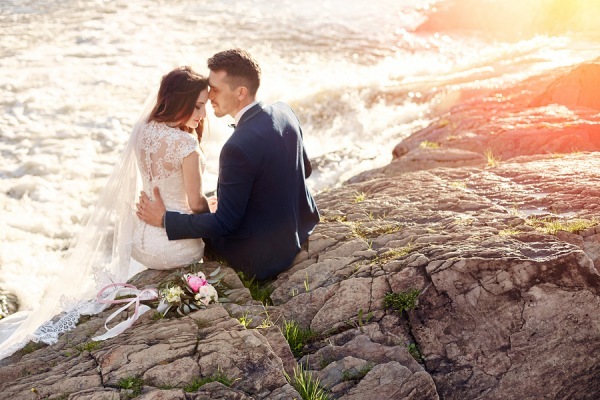 Exclusive nuptials at a beach resort are, by definition, limited to the closest family and friends of the bride and groom. No one expects large numbers of acquaintances to take the time and expense to travel to a distant locale just to attend. The good news is that a tropical wedding with a smaller guest list can often be had for less than the cost of a big wedding held in a church in your hometown. And while we’ve planned weddings at sea, our preference is for an exotic all-inclusive resort, with plenty of activities and sightseeing as part of the mix. 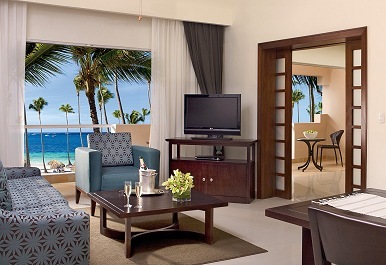 Like the Dreams Palm Beach Punta Cana, the AAA Four Diamond resort situated on a picturesque, powder-white beach in the Dominican Republic. This friendly, relaxing world includes gorgeous scenery, the majestic turquoise Caribbean and the inclusions of Unlimited-Luxury. Wedding packages run the gamut from Basic to Ultimate and are all value priced. Options can include the personal touch of on-site wedding coordinator; preparation and ironing of the couple’s wedding day attire; hairstyling and makeup application; bouquets, corsages and/or boutonnieres; ceremony décor – floral centerpieces, tables and aisle runner; wedding cake and sparkling wine; hors d’oeuvres; a private dinner reception; special turn-down service the night of the wedding; couples’ spa treatments; video and/or still photography taken during the ceremony and a wedding album. Each wedding is unique and can be as elaborate as your budget allows. Four nights (land only) start at $439 per person, based on double occupancy. Book the Preferred Club Honeymoon Jacuzzi Suite or higher, for a minimum of 7 nights OR if your wedding party books 5 rooms in any accommodations category for a minimum of 3 nights, and the Basic Wedding Package is provided without additional charge! All weddings, regardless of size, must be booked a minimum of 30 days in advance of the wedding date, and are subject to availability. and double occupancy only. Prices and package subject to change without notice. The complimentary wedding package cannot be deducted when purchasing other specially priced vacation packages. *Additional fees apply for service of a judge or minister, or you can bring your own. Once wedding is confirmed it cannot be canceled within 6 months of the date of the wedding without a cancellation penalty of $100. 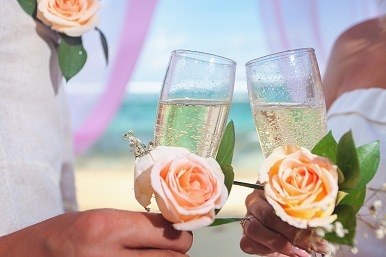 The complimentary wedding package may not be available during all dates and times at the discretion of the resort.